Humanity is an instrument and each of us, a note. On a Human Scale is an ongoing mission to create a fully playable instrument of humanity. 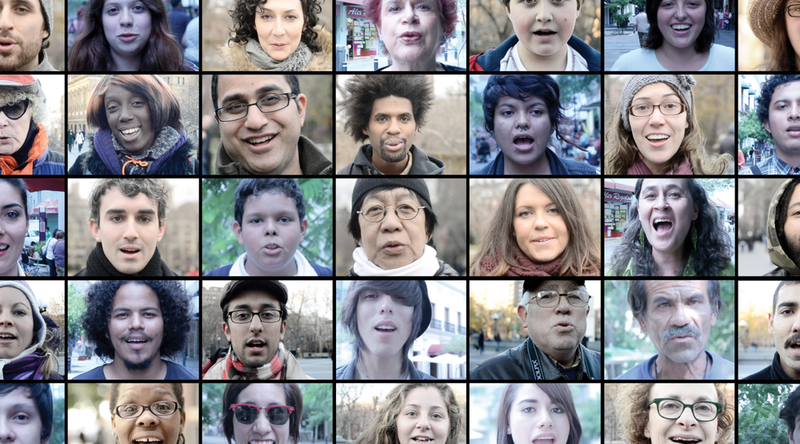 This global collaborative experiment began by filming a vast cross section of everyday New Yorkers singing. Their individual notes are woven into a fully interactive video installation that the public is invited to play, using a piano. From amateur key banging to virtuosic recitals, each player of the instrument brings to life an immersive audio visual experience that fuses music, film, people and technology into a living, breathing, singing cross section of humanity. A symphony with many faces. On a Human Scale is a vast experiment to unite the voices and faces of the world. It is an installation that can be played by anyone, exploiting technology to uncover a deeper human experience. It is a stage for performance where world class musicians can collaborate with the music of people from around the world for audiences everywhere. It is ever-growing, innovative documentation of humanity and the power of music and technology to unite us. The project was born as a 2 octave prototype using a toy piano and has since grown to 4 octaves or 49 keys housed in an antique harpsichord. We have created melodic scales with Guadalajara, Mexico and New York City, and percussive instruments that turn humans into drums; but the journey has only begun. Two cities does not an instrument of humanity make. The more cities we can bring the instrument to, the more of humanity's music we can capture, and the deeper and more transcendent our human instrument becomes. We believe music and technology have the power to unite humanity. Lets play together. On a Human Scale New York was made possible in part with public funds from the Manhattan Community Arts Fund, supported by the New York City Department of Cultural Affairs in partnership with the City Council and administered by Lower Manhattan Cultural Council.